Google in the undisputed king of search engines with no other coming even close to claiming the throne. It claims a 75% share of the US market and racks up a total of 40,000 searches per second. Because millions of people turn to Google to make purchasing decisions, the owners of businesses should understand how Google Search works to get their website listed as high as possible on the results page. The search engine results page (SERP) appears when someone types a search query into the search engine. In this blog post we will discuss exactly how Google ranks the websites that appear on the results page. 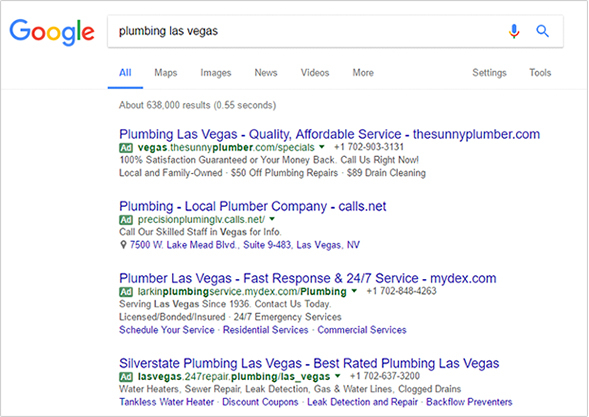 When conduct a search in Google, you may have noticed the results at the top and bottom of the results page are noted as ads. These sections are powered by pay-per-click advertising or Google AdWords. As a business owner, you can have an ad listed in these sections by creating a Google account, writing ad copy, and setting a price. Google decides which ads to rank based on quality and relevance and how much you bid against others for specific keywords. If you own a sushi restaurant keywords you might bid on are “sushi” and “japanese restaurant”. When an internet user searches for those terms, your ad has a chance of showing. We’ll discuss more about Google determining ad rank below. 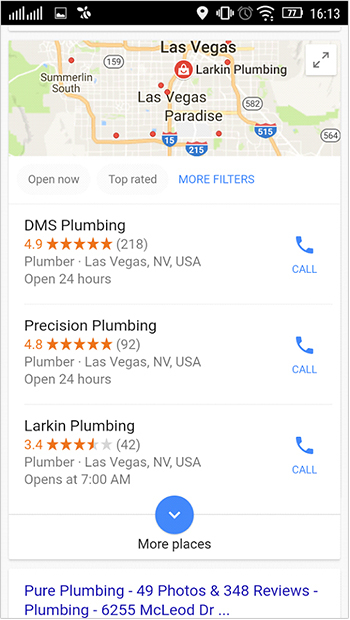 This part of Google is of extreme importance to local businesses as it uses the person searching’s location to show the businesses closest to them. For example, if a person searches for “sushi near me,” the local results section will show three sushi restaurants that are near where the person searching is, it also gives the restaurant’s rating, address, and working hours. We’ll give more information later in this post. Organic results are websites Google believes are of the most interest and relevance to the user based on the search query they made. Google utilizes a complex algorithm to select which sites to list on the search’s first page. The sites that feature in this section are usually well-known websites. If completion is high for your type of business, it can be difficult to appear on the search result first page, but we’ll explore methods to get your business listed in the organic results. If you only think about Google on desktop, then you fail to recognize more than 50% of your potential customers. Why? Because mobile has now surpassed desktop as the primary device people use for searching Google. There’s less screen space on a mobile device meaning messages need to be straight to the point. People using their phones are more likely to visit a business on the same day, meaning messages should be tailored depending on if they are for desktop or mobile. How do paid results work in Google search? Google makes a decision on which ads to run based on the ads it believes will receive the most clicks. Since these are pay-per-click ads, Google ensures it only show ads for a search that have higher chances of getting clicked on. Google’s multi-billion dollar market value is due to its advertising revenue, making it clear Google ads work and drive traffic to websites using Google advertising. Whether an ad shows on mobile or desktop or both. The 'bid' is the price you pay for a click when an ad appears based on a specific keyword or keywords. The bid gives you the ability to set the cost as low or high as you want, but you will be in competition with others bidding on the same keyword/s. The cost of a click depends on how much other businesses bidding on the same keyword/s will pay. If you own business in a small town you may be able to bid as little as $1 per click on a keyword and have your ad appear in this section. However, in a big city with more competition, the cost per click will be more expensive. This is about how relevant your ad is to the search made. If someone searching for a medical clinic, an ad for your sushi restaurant will not appear, no matter how much you spend. An ad needs to match the search query made. People usually search for goods or services plus the location, you need to ensure you include product and location information in an ad. The page your ad is linked to needs to use similar keywords as the ad. This means what is mentioned in the ad needs to correspond to the webpage content the ad links to. If you own a coffee shop and are advertising a new blend, the ad should link directly to the landing page where customers can order the blend instead of the homepage. How do paid search results work on mobile? On mobile the paid results section works pretty much the same way as on desktop. Google decides the ads that appear based on the above three factors. When you choose to run an ad, the default will be the ad runs on desktop and mobile. However, you have the ability to make it run only on mobile devices. One of the benefits of running ads only on mobile is the copy of the ad can be written to specifically target people using phones. 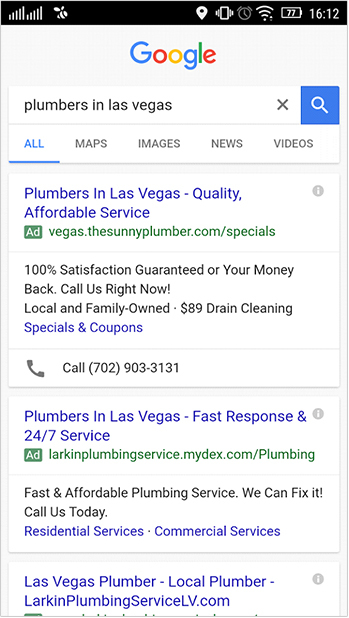 When your business runs a mobile ad, it’s a good idea to add ad extensions, meaning people can click to call and click to get directions. Making it easier for people to locate or contact your business can lead to a dramatic increase in conversion rates. These type of ad extensions do not carry additional cost, and you only pay when an internet user clicks on the extension, the same as with the rest of the text ad. Enable ad extensions by logging into your account finding the tab labelled “Ad extensions”. How do Google’s local search results work? Local search results on Google are usually listed below paid search results, and Google displays three local businesses based on the distance each search result is from the location term used. If a user does not state a location in their search, Google calculates distance based on what it knows about the location of the user. This is an extremely important section for businesses open to consumers, since they are predominantly supported by local customers. It is free to be listed, but you need to complete a few key steps to make sure your business turns up in search results, and not your competitor’s. How do you get your business to show up in local search results? Below are the factors Google uses to determine the businesses that will show up in local results. These factors measure the prominence, distance and relevancy of local results. GMB helps businesses determine their relevance and is a free tool for managing a business’ online presence on Google. It allows users to list a category for their business as well as the services and products it offers and a business description, Google can match the information on the GMB page against the search to ascertain if your website is relevant. For this reason you want to make sure the information on this page is accurate and you have verified your business. If not, people searching could get inaccurate information, or your site won’t show up at all. This is straightforward. Ensure your address is listed as correct on your GMB page and across all directories. Some examples of directories you should list your business are TripAdvisor, Yelp and directories that are industry specific. If your business has more than one branch or location, you need to list all physical addresses so you will show up in local search results across multiple locations. Citations are made up of your business’ name, address and phone number. Google determines if a site is popular via citations. If various different and well-known sites cite your business, Google will then know your business is prominent. However, citations serve little value unless they have consistency. Google has to be able to correctly attribute all citations to the same business. For this reason ensure you have list your business name, physical address and phone in the same way across all directories. As well as consistency, the quality of citations is just as important. Google does not trust (sometimes even penalizes) citations coming from low quality sites. Some examples of high quality citations come from sites such as Yelp and Foursquare. How do local search results work on mobile? 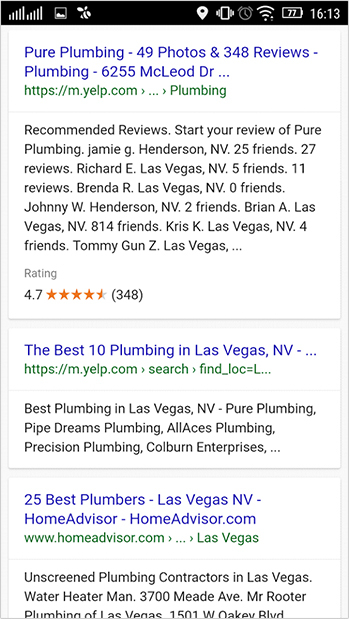 Local results on mobile also displays three businesses, the same as the desktop version. 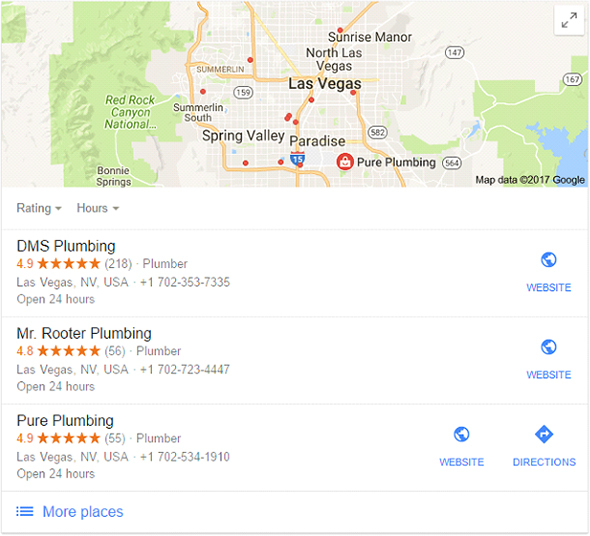 The largest differences are the smaller map meaning Google shows plumbers closer to the location of the user than with a desktop search, and the businesses display a click to call button. This is information gleaned from Google My Business, so you should ensure you display and include as much information as possible on this webpage. 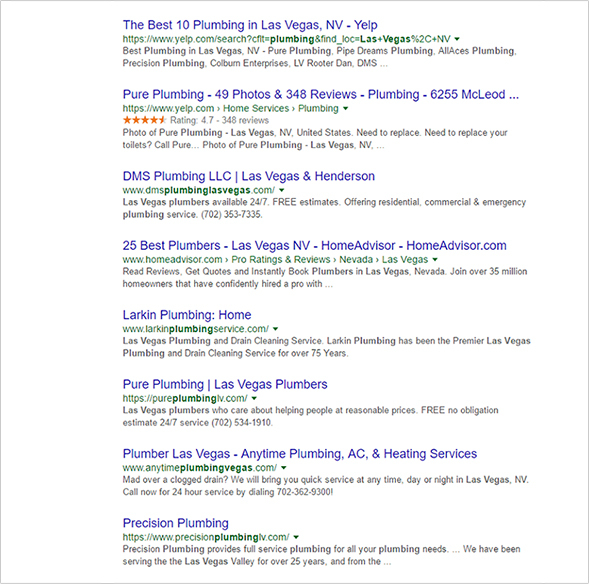 How do Google’s organic results work? Google takes the popularity of a site and the relevance of it to a person’s search to determine organic search results. These organic results are listed directly below the local results. The greatest benefit of your business being listed in organic search results is that it is free, and there are more terms you can potentially rank for than in the local results. How do you get your business to show up in the organic search results? A website that has high authority is also a high quality website respected by people in its industry (think Yelp or Facebook). To increase your website’s authority, you need to demonstrate people in your industry enjoy it. The most efficient way to do this is by respected sites linking to your website. Ensuring your website appears for search terms your customers use, you need to ensure you include those keywords in your URL and within your website pages. It takes time to get listed in organic search results, especially if your website is new. The amount of time needed varies, but usually it takes a few months. However, this can depend on how hard you work at it. Your website needs to gain credibility on the internet before Google acknowledges it is useful enough for the person searching for it to appear on the results page. It’s easier to be listed in organic search results if your business is in a less competitive market. For example, if you own a shoe store in a small town, your website is much more likely to appear on this section’s first page than if you own a jewelers in a major city. If you notice a few months go by and you are still not listed in this section, do not lose hope. A simple way of getting listed here is to use the authority of other sites, such as Facebook and Yelp. Social media sites are examples of websites with high authority you can list your business on. When someone searches directly for your business, or for a business in your industry, your social media sites should show up in the organic results and therefore your brand should occupy a lot of space on the first page. People are more likely to go to a café, bar, or restaurant that has good reviews. When you have your social media pages listed, the reviews you have on Google, Facebook and Yelp are also listed. Ensure you respond to customer reviews, and request people leave reviews on your site. Online reviews are crucial particularly to a small business, so do not hold back in asking loyal customers to write a review for you. If you worry about receiving a negative review, bear in mind you can respond to such reviews constructively and they will not necessarily damage your reputation. How do organic search results work on mobile? Organic results appear very similar on mobile to the way they do on desktop. The main difference is how much space is given on mobile to each site. Ensure your site is mobile friendly and if you find it is not, you will notice you may rank in desktop organic results but not on mobile. Being ranked on Google’s search results page is important to drive web traffic to your business website and gain new customers. Now you have some understanding of how Google search works, you need to place your focus on being listed in local results. However, if you find you do not rank in the top three, consider making use of Google AdWords to ensure your site shows on the search results’ first page. To rank in organic results, the best way is to get your business listed on third party sites with higher ranking authority, such as TripAdvisor and Yelp.